i’m crying foul on mcgwire’s confession. | six words to change the world. ← ellen, get out of my head. i’m crying foul on mcgwire’s confession. Still, McGwire told Costas he “absolutely” could have broken the record without using steroids, pointing to his home run prowess going back to Little League. “That’s why it’s the most regrettable thing I’ve ever done in my life,” McGwire said. I find it cowardly because there’s something frustrating about someone who does something they blatantly know is wrong with the hope/knowledge that one day they can apologize for it and all will be forgiven. 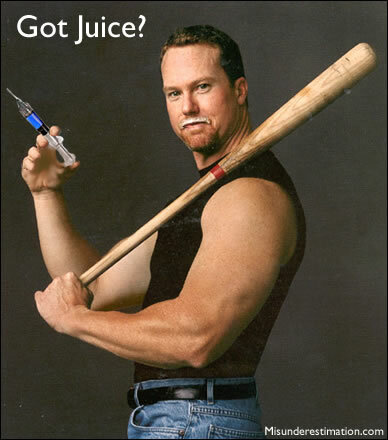 I’ll make a few things clear: first, I’m sure McGwire was under a lot of pressure and that this steroid thing probably has caused him a lot of agony over the years; second, I know that he didn’t have to come clean, and that he is putting his reputation at risk with an admission like this; and third, I’m sure he’s not the only one who holds this secret. All that said, he was a grown man back in the ’90s and he knew that what he was doing was wrong. It reminds me of when someone apologizes to me for doing something wrong and I’m all WHELP, glad you’re sorry, but that doesn’t change the fact that I’m pissed. “Sorry” isn’t always some magic get-out-of-jail free card that instantly erases all wrongdoing. NO, NO I DO NOT FORGIVE YOU. And the funny thing is…I don’t care about baseball. I’m not sure why this is getting me all riled up. What do you guys think? Am I overreacting? Giving him too much credit? Is this old news, since according to my officemate, Cardinals fans have known about this for years? Am I ignoring the real infuriating story of the hour, which is the announcement that Sarah Palin will be joining Fox News as a contributor?